« If you ride to the left you will lose your horse, if you ride to the right you will lose your head. Royal Oak — Where there is road, there is a classic car. Where there is grass, there is a Dream Cruise fan. Where there is an open space, there is a vendor ready for business: Woodward Avenue has been transformed into Dream Cruise paradise. Visitors will find cars, fans and gathering spots on nearly every edge and corner of Woodward from Ferndale to Pontiac , all in preparation for the world’s biggest one-day car show Saturday. But as everybody in Metro Detroit knows, the party starts early for the 16th annual Woodward Dream Cruise, with plenty of events Friday leading up Saturday’s cruise from 9 a.m. to 9 p.m.
Today was a busy day of preparation for the people, businesses and communities along Woodward, where parties are hosted and events are held for more than 1.5 million people who come to the Cruise every year. Tents popped up at Memorial park at Woodward and 13 Mile in Royal Oak, where Dream cruise events are held Friday and Saturday. Police in Ferndale worked to close East Nine Mile in preparation for Friday’s 10th annual Ferndale Emergency Vehicle Show, which starts at 1 p.m., and an official Cruise ribbon-cutting at 5:30 p.m.
Officials in Berkley are gearing up for the Berkley Dream Parade, which starts at 6:30 p.m. Friday at Woodward and 12 Mile and goes west through downtown. Cruiser Paul Imerman spent today at the corner of Woodward and 13 Mile, where he parked his 1971 Buick Centurion, a shiny red convertible. On Tuesday, Fred Drew drove in all the way from St. Thomas, Ontario, to both cruise and snooze on Woodward prior to Saturday’s main event. 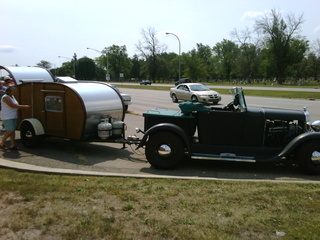 Drew crossed the border in his “mostly” 1929 Ford coupe , towing his wood, retro-inspired, hand crafted, teardrop design one-person trailer. “I call it a mostly 1929 Ford because it had parts from a lot of different years,” said Drew, a retired security supervisor. While the Ford is an eye-catcher, the real crowd pleaser is Drew’s funky little trailer. At 11 feet long, four feet wide and four feet high, this crusin’ cabin meets all of Drew’s needs. “I built it myself in 1997-1998 and good or bad, the entire idea came out of my head,” said Drew with a laugh. The tiny trailer is equipped with nearly all the comforts of home, including a propane powered heater, refrigerator/freezer and two-burner stove. It also has a sink and running water. Drew opens a small door on the side of the wooden mini RV to reveal surprisingly spacious sleeping quarters. While the trail definitely isn’t a “double wide,” it is just big enough for one person or two good-sized Labrador retrievers. “There’s no problem sleeping in it, because it’s very comfortable,” Drew said. BERKLEY, Mich (WXYZ) – When Fred Drew left Ontario in his rebuilt 1929 Ford for the Dream Cruise, he had everything he needed in his trailer plus the kitchen sink. Fred’s life on wheels includes his Ford, which pulls his bedroom and kitchen wrapped into one tiny trailer he built himself. He got the idea after a bad stay at a bad hotel. “My non-smoking room had cigarette butts on the floor and I thought I don’t want that again,” said Drew. So he built his own trailer. It’s four feet tall, four feet wide and eleven feet long. His bed is a three-quarter sized matress, and he climbs in through a side door. After a cozy night’s sleep, he walks around back and lifts the door to his kitchen. “Underneath the canned goods is a seven gallon tank so I have water to make my coffee or tea with,” said Drew. The tiny kitchen is complete with a two burner stove and a fully stocked dorm fridge. Fred has traveled around the United States to car shows and he loves the freedom the tiny trailer home gives him. “It’s a great life, you should live it,” he said. This entry was posted on August 20, 2010 at 7:24 am and is filed under Teardrop Trailer News, Uncategorized. You can follow any responses to this entry through the RSS 2.0 feed. You can leave a response, or trackback from your own site.